Copenhagen police confirm that 22-year-old Omar El-Hussein is behind the weekend's double shooting. 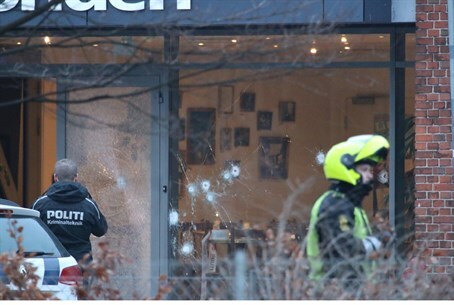 Copenhagen police late Tuesday confirmed the identity of the suspected gunman behind the weekend's double shooting as 22-year-old Omar El-Hussein, AFP reported. Police also said that in his first attack, on Saturday, El-Hussein had unsuccessfully tried to use several entrances to a cultural central that was hosting a debate on Islam and free speech attended by controversial Swedish cartoonist Lars Vilk. El-Hussein, a Danish-born man of Palestinian origin, was killed in a shootout with police early Sunday after opening fire at the cultural center, killing a filmmaker, after which he shot dead a Jewish man outside a synagogue. Five police were injured in the attacks. On the street outside the cultural centre where the event was being held he met his first victim, whom he shot with a weapon later found on a football field at Mjoelnerparken, the low-income housing estate where he grew up, it said. El-Hussein had been identified by Danish media on Sunday as a man “a history of violent crime” who had only been freed from jail two weeks before the attacks. A Lebanese website reported that he was of Palestinian Arab origin and that his parents had resided in a camp for “Palestinian refugees” in Lebanon before moving to Denmark. Vilks said earlier on Tuesday that Danish police had underestimated the terrorist threat since January's Paris attacks. "The attacker had good weapons, he had better weapons than the police... There was an escalation since the Charlie Hebdo attacks (in Paris) and the Danes had not caught onto that," he told AFP. "They did not step up security on Saturday. It was the same as we had previously... they must consider whether they need to be better armed," Vilks added, referring to the cultural center in Copenhagen that was the focus of the first of the twin attacks.